Transform Your Mood With Yoga! Home → Kids Yoga → Transform Your Mood With Yoga! We all have times when we are not quite feeling ourselves, a little unfocused, grumpy, or just plain feeling off. Maybe we start snapping at people. Or we just can’t seem to follow along with the crowd or do what we’re “supposed” to be doing. Try this yoga pose whenever you want to get back on track to feel better about yourself and the world around you. Sit down with your feet together. Breathe in while you stretch your arms up. Out breathe while you bend from your hips. Bring your chest as far forward as you can keeping your legs straight. Reach for your toes, ankles or shins. 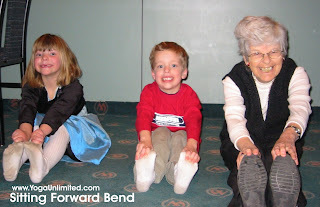 Take a few relaxed breaths as you stretch forward. To finish come up slowly and then sit crossed legged for a few breaths. Notice how great you feel afterwards. Pretend you are on a sled ducking under a long bridge. (my favorite) Sometimes when you are holding this pose very still, breathing relaxed, a little ant (spider or frog) mistakes you for a hill and crawls up your back. When the kids are still, crawl your fingers softly up their backs. You can do it a few times with anyone who is still holding the pose. This is a great warm-up stretch that can turn your frown upside down. Try it anytime you want to feel great.